This is a walkthrough for the uncensored English translation of the “Hello,good-bye” visual novel by NekoNyan, available over at Denpasoft, Mangagamer, or Nutaku. It was originally developed by Japanese company Lump of Sugar. This guide is simply a translation of the original Japanese walkthrough by Seiya-Saiga. So all credit to them. 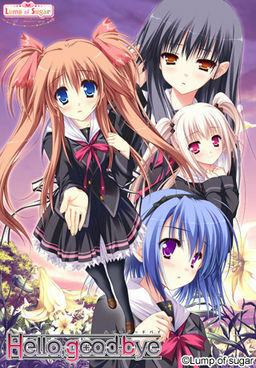 There are 4 main heroines in “Hello,good-bye” (May, Suguri, Natsumi, Koharu). You’ll need just 2 save slots, and you’ll also unlock all CGs as you go. The game also has a built-in achievement system. After finishing a route and starting a new game the choices will have changed to the same options as behind the continue screen. I Don’t Need Your Help, Game! Hm, What Should I Pick? I’m Out of Save Slots? !